Cristiano Ronaldo set a La Liga record for hat-tricks and gave Real Madrid a record 18th straight victory in all competitions with a superb performance against Celta de Vigo. 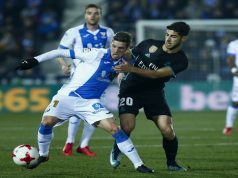 Los Blancos struggled to find their best game against a solid Galician side, but the Portuguese’s quality made the difference and put Real five points ahead in the table and one victory short from breaking an all-time record. The visitors started strongly, exerting a high pressure and preventing Los Blancos from controlling possession. Carlo Ancelotti men had to play a more direct game, and Celta defence dealt well with it. 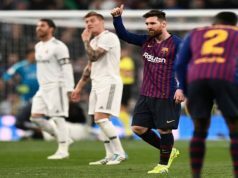 Los Merengues had the first chance as Toni Kroos sent a superb cross to Ronaldo, who fired an overhead to the roof of the net. A few minutes later, the Portuguese was denied by goalkeeper Sergio Alvarez, who punched away the striker’s short-range effort. However, Ronaldo would not miss his third attempt. Celta’s left-back Jonny brought CR7 down into the box and the referee pointed directly to the penalty spot. Ronaldo step up and made it 1-0 for the hosts. Los Blancos were comfortably the better team in the first half, but Celta’s solid defence kept the visitor’s hopes alive. Eduardo Berizzo men had a great start to the second half, threatening Iker Casillas in a couple of chances. However, the game soon became lethargic, with both sides struggling to string passes together. Yet, Ronaldo appeared to bring some light and make it 2-0 for Real Madrid with a great volley. The keeper got a firm hand on it, but couldn’t keep it out. The Portuguese sealed a perfect night with less than ten minutes to go as he converted a cross from Marcelo. It was his 23rd goal in La Liga this season, and his 200th goal in the Spanish competition.